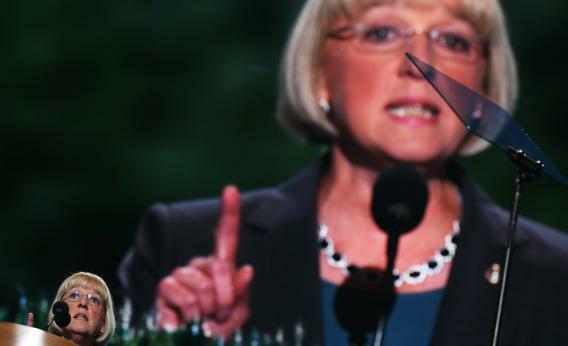 Patty Murray on Fiscal Cliff: It's easier with the new baseline. CHARLOTTE, NC - SEPTEMBER 05: Chair of the Democratic Senatorial Campaign Committee, U.S. Sen. Patty Murray (D-WA) speaks during day two of the Democratic National Convention at Time Warner Cable Arena on September 5, 2012 in Charlotte, North Carolina. Until recently, Patty Murray’s name hasn’t really rung out inside the Beltway but over the past twelve months her visible clout has increased enormously. She took over the seemingly thankless job of running the DSCC, she steered the Democratic effort on the “supercommittee,” she then triumphed in the November Senate elections and now is poised to take the gavel and chair the Budget Committee now that Kent Conrad’s retired. I also think many Republicans are starting to realize something very important. On January 1st if we have not gotten a deal, Grover Norquist and his pledge are no longer relevant to this conversation. A name, by the way, that I heard repeatedly by Republicans over and over in the Super Committee will no longer be a part of this debate. We will have a new fiscal and political reality. If the Bush tax cuts expire, every proposal will be a tax cut proposal, and the pledge will no longer keep Republicans boxed in and unable to compromise. If middle class families start seeing some money coming out of their paychecks next year, are Republicans really going to stand up and fight for new tax cuts for the rich? Are they going to continue opposing the Democrat’s middle class tax cut once the slate is wiped clean? Now Murray went on to say that she thought this realization would inspire Republicans to make a deal in 2012. But as she suggested, the Norquist Pledge really does change things in this regard. In terms of real world policy outcomes, Republicans have a stronger hand using the 2012 baseline than using the 2013 baseline. But in terms of getting a deal that Barack Obama will sign and that meets the terms of the Norquist Pledge, it’s much easier to use the 2013 baseline.